Journey Into Incident Response: Is the System Infected? My previous post provided a little background information about the images I am referencing. One of the earlier steps to identify an infection would be to search for known malicious code by scanning the computer or image of the computer with various anti-virus products. However, I wanted to find the infection by examining the system’s volatile data so I wouldn’t have to be solely dependent on anti-virus products. I thought about the time a test system was accidently infected with Trojan and the anti-virus product did not have a signature for it. Volatile data examination helped me locate the malware even though my anti-virus was ineffective. Plus I wanted to learn how to examine volatile data, which is also one of the earlier steps. * Review the strings associated with a process or driver of interest. Basically, the examination is looking for what does not belong. Unusual ports, processes, files, DLLs, and filenames. I found having a baseline system to reference was useful for some of the steps, such as the steps for reviewing the DLLs and drivers. The tools I used for the collection and examination was Mandiant’s Memoryze and AuditViewer. If you want to read a few blog posts on how to use these tools check out The Digital Standard here then here then here. The review of the open ports and network connections involve looking for unusual or unfamiliar Internet Protocol addresses or ports as well as taking into consideration the processes involved. The picture below displays a section of the port’s section for Infected 1. The activity in the image looks pretty normal with one open port on 135 for Microsoft's RPC and Internet Explorer connecting to the default HTTP port (80) on a remote system. The activity may look pretty normal but Internet Explorer was not visible on the system when the memory image was acquired. This was the first red flag in Infected 1 that needs to be examined further. The second image referenced in this post (Infected 2) appeared to be infected with rogue security software which prevented any new processes from running. This rogue software prevented the memory imaging software from executing so to bypass the rogue software the memory was imaged as soon as the user logged on. This enabled Memoryze to execute before the rogue security software but Memoryze also executed before the network services fully loaded. This resulted in the memory image not containing any information related to network connections or open ports. The review of the running processes involve looking for which ones do not belong. For each process the following is some of the information that should be reviewed: process’s executable path, command argument to launch the process, the security context of the process, and the enumerated handle information such as the open files and registry keys. For Infected 1, the review of the open ports and network connections showed an unusual network connection involving Internet Explorer. This will be the first process examined as illustrated below. The command argument shows the Internet Explorer executable path is correct but the argument used to launch Internet Explorer included an URL in order which makes Internet Explorer connect to the website when it launches. The last bit of information from the picture shows that Internet Explorer is running in the context of the local administrator account (Security ID ending in 500). The review of the rest of the running processes in Infected 1 identified another questionable process, which is shown in Figure 3. Asr64_ldm.exe is questionable because the program was launched from a temporary folder, which is not a standard location for programs to be run from. This process is also running in the context of the local administrator account similar to the Internet Explorer process. The review of the processes in Infected 2 identified three unusual processes. The first process is illustrated in Figure 4. The svchost.exe process is highlighted in red because the process has an injected DLL, and the rating next to the process was done by the MRI feature. Despite this process being highlighted by Auditviewer, the other characteristic that makes it unusual is the command argument launched a program called aaclienttt.exe instead of svchost.exe. This action is trying to hide the presence of aaclientt.exe by running the program under a different name. If someone were to use the task manager to inspect this process they would only see the name svchost.exe listed in the processes tab. The review of the open file handles for aaclientt.exe shows the process has a few files open including a .dat file. This is shown below. 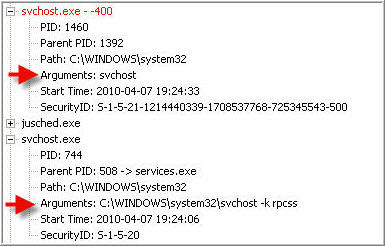 The second unusual process in Infected 2 is another svchost.exe process. This process also had an injected DLL and a MRI rating. The characteristic of this process making it unusual is the lack of switches in the command argument used to launch the svchost.exe program. The other svchost.exe processes' command arguments use a switches as illustrated in Figure 6. The last unusual process in Infected 2 is shown in Figure 7. Similar to Figure 3, the unusual characteristic about this program is the path it was started from, which was the applications folder in the All Users profile. The enumerated handles for this process, 75622830.exe, also revealed something interesting. The task manager was a process as shown in Figure 8. As mentioned previously, Infected 2 was obtained from a system that appeared to be infected with a rogue security application that prevented any new programs from running. Not only did the rogue security application prevent the memory imaging software from running, but at the time of imaging the application also prevented the task manager from starting. The process 75622830.exe appears to be the rogue security application since the task manager is listed as a child process. I thought a brief definition of system hooking would be helpful before I explain this step. The Wikipedia webpage defines hooking as a range of techniques used to alter or augment the behavior of an operating system or other software components by intercepting function calls, messages or events passed between software components. There are several methods and techniques for hooking, and I found the Hacking Exposed Malware & Rootkit book provided a good explanation of the different types of hooking. Also, openrce.org has a good article about a malware sample that uses hooking. Similar to the previous steps, the review of the hooking involves looking for what doesn’t belong. The picture below shows the System Service Descriptor Table Hooks for the Infected 1 image. The picture shows that two functions are being hooked but the name of the hooking module isn’t displayed. I still have to follow up on what would prevent a name from not displaying in this area. The Infected 2 image did not have any hooks in the three hooking techniques displayed by AuditViewer. Another definition before I explain this step. Microsoft’s MSDN defines a DLL as an executable file that acts as a shared library of functions, which provides a way for a process to call a function that is not part of its executable code. The review of the loaded DLLs is to determine if any are rogue. This was one of the steps I thought was helpful to compare the infected memory images to a memory image from a known good system. There are a lot of DLLs loaded on a system and I found it hard to determine which ones actually belonged on the system. If I do eventually become a cyber investigator then I will be keeping this tip in mind because I would want a baseline of all of the standard configurations for the computers on the network. I was unable to locate the DLLs that were present in the Infected 1 image during this step but I was able to find them once I completed the review of the strings step. As for the Infected 2 image, there was no rogue DLLs. The review of the open files on the system can not only show unauthorized files on the system but the review can also show what files a user and/or process was accessing at the time of the memory image. I reviewed the open files in both images but I wasn’t able to identify anything else in addition to what I found using the other examination steps. Plus there wasn’t much time available for additional files to be opened because once the system became infected it was disconnected from the network and imaged. 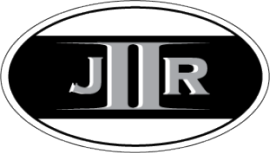 The review of the drivers involve looking for unusual or unfamiliar drivers. The review of the memory images found that Infected 2 did not have any unfamiliar drivers while Infected 1 did. If you remember Infected 1 was also the image that had hooked functions (refer to Figure 9). The picture below shows the driver in question, which is the _VOIDd.sys driver. This driver appeared in the list of drivers where the memory image was scanned for driver objects but didn’t appear in the list of drivers from traversing the PsLoadedModuleList. The AuditViewer documentation explains the significance of this but basically the driver is hiding from the operating system because the PsLoadedModuleList contains the list of drivers the operating system can see. Finally we are at the last step, which is to review the strings associated with a process or driver of interest. The strings of the _VOIDd.sys driver found in Infected 1 were examined. The picture below shows an unfamiliar DLL that has a similar name as the driver. At this point I decided to try to search the memory image for DLLs starting with the name of “_void”. 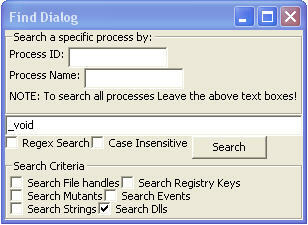 Using the search feature in AuditViewer (shown below) I searched all of the DLLs on the system and there were about five processes that had a loaded DLL with name starting with _void. Infected 1 had the instance of Internet Explorer connecting to a remote host so I reviewed the search hits for Internet explorer. There were two unfamiliar DLLs and neither of them was the DLL first found in the driver strings. The strings of the 75622830.exe process found in Infected 2 were also examined. The first interesting set of strings is shown in the picture below since this was the error message that appeared when the task manger was blocked from running. The next string of interest is probably what would have appeared if I selected the option to remove all of the infections. The examination of the memory images from the infected systems provided me with a few files to examine first. The Infected 1 image had the following: suspicious Internet Explorer process, rogue asr_64_ldm.exe process, hooked functions, rogue _VOIDd.sys driver, and rogue DLLs with name starting with _void. The Infected 2 image had the following: rogue aaclientt.exe process, one file of interest opened by aaclientt.exe, svchost process with an injected DLL, and rogue 75622830.exe process. The initial question of is the system infected requires an additional examination step in order to determine if the files are malicious. This step is to confirm if the file is malicious. The files can be acquired directly from memory or the files can be accessed from the hard drive. I opted for the latter option and submitted the files to VirusTotal for scanning. All of the files were confirmed as being malicious with a detection rate less than 20 percent when I uploaded them in the Spring. The examination of a memory image is one method that can be used to find an infection on a system, and one additional step can be used to confirm the infection. This was the process I used to answer the question of is the system infected. However, I think the examination of memory is just one step out many that is required to examine an infected system. I am interested in how others approach examining a memory image to locate an infection. Are you doing anything different than what I posted? My next blog post will explain a few more examination steps to answer the question of how the Infected 2 system became infected. *Hint* I visited a malicious website listed in Contagiodump's March links. Hey there. Nice post. Did you ever find out why the HookingModule field was blank? I am presuming you could find the offset in the memory dump listed and try and work out what is located there? At the time I was able to locate the malware through other means so I never looked into this deeper. I would be interested to know what could cause it though.